"Execution of the Strategy in The Process of Process Management"
The execution of the strategy in the process of process management can be people or technology based – or a combination of both. Organizations need to master a systematic strategy execution and deal proactively with the opportunities and threats in this “digital world”. The Process of Process Management (PoPM) was developed to build and run a value-driven BPM-Discipline for strategy execution. The BPM Discipline delivers significant business value by transferring strategy onto people and technology based execution – at pace with certainty so that it can meet the requirement of a systematic strategy execution and benefit from the opportunities of digitalization. This whitepaper defines the BPM-Discipline and its value. It gives you an overview of a reference model developed for the PoPM and how it can be applied to build and run a value-driven BPM-Discipline for perfect strategy execution. 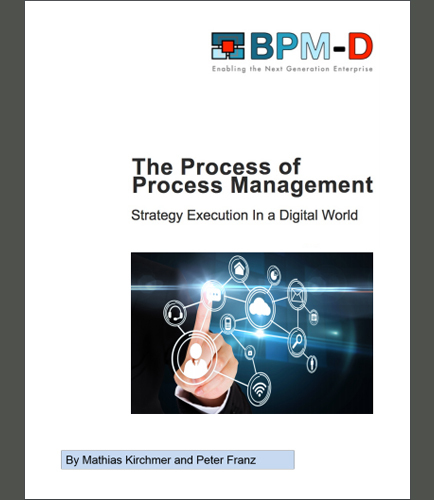 How BPM uses the “business process” concept as a vehicle for cross-organizational strategy execution? How the Process of Process Management (PoPM) has operationalized the Business? How can we enhance the value in Process of Process Management (PoPM)? How can value be driven by improving execution of strategy using BPM-Discipline? Four core frameworks that describe the Process of Process Management (PoPM).